One of the strategies developed to deal with the conflict between white American settlers and Native American lands was to negotiate treaties which voluntarily exchanged the lands of Indian tribes in the east for lands west of the Mississippi. Five assimilated tribes, the Cherokee, Creek, Choctaw, Chickasaw and Seminoles, known as the “Five Civilized Tribes” negotiated approximately thirty treaties with the United States between 1789 and 1825. In 1824, President Monroe announced to Congress that he thought all Indians should be relocated west of the Mississippi. Monroe was pressured by the state of Georgia to make his statement because gold had been discovered on Cherokee land in Northwest Georgia and the state of Georgia wanted to claim it. The Cherokees resisted and sought to maintain their land. They had adopted a formal constitution, declared an independent Cherokee nation, and elected John Ross as their Chief in 1828. As expected, the Georgia legislature annulled the Cherokee constitution and ordered seizure of their lands. The Cherokees again resisted and took their claim of sovereignty to the United States Supreme court. In their second case, Worcester v. Georgia (1832), Supreme Court Chief Justice John Marshall ruled that the Cherokee Nation was entitled to federal protection over those of the state laws of Georgia. The Court ruled “the Indian nation was a “distinct community in which the laws of Georgia can have no force” and into which Georgians could not enter without the permission of the Cherokees themselves or in conformity with treaties. Although the Supreme Court ruled in their favor, the state of Georgia confiscated the Cherokee lands, surveyed them into 40 acre lots and distributed to white settlers through a lottery system, which is depicted in this image, "A Map of the 18th District, 1st Section, originally Cherokee now Union County." The names of the counties were changed to reflect their new owners. The county here, Union County, was one of the regions where gold had been discovered on Cherokee lands and started the first gold rush in 1829. Robert V. Hine and John Mack Faragher, The American West, A New Interpretive History (New Haven: Yale University Press, 2000), 176, 235-236; Mary Beth Norton et al, A People and a Nation; A History of the United States. (Boston: Houghton Mifflin Company, 1986), 287-290. 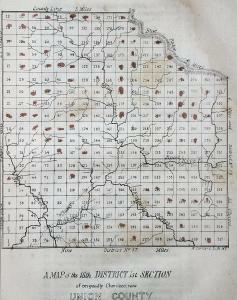 Exact Title: The Cherokee Land Lottery, containing a numerical list of the names of the fortunate drawers in said lottery, with an engraved map of each district.